There are a lot of pros to adding networked storage to your home: You can backup your files, use it stream media around the home and even sometimes serve data out over the Internet to devices so you can access your information on the go. The big problem is that none of the companies making these devices seem to understand pricing, and so long as they don’t figure this aspect out, they are never going to see wide acceptance by people outside of the general tech geek circle. CNET is reporting on a new line of NAS (Networked Additional Storage) devices that sound pretty sweet when you look at all they will do. The ReadyNAS Ultra line will allow you up to 12 TB of storage, and does all of the usual stuff like redundant backups, and so on, but then it adds in some pretty spectacular extras. You can use the ReadyNAS Ultras as additional storage for your TiVo DVRs, giving you the capacity to store an incredible amount of recorded content. You can then share those programs with any other compatible TiVo in your home making for an immense amount of television shows and movie at your disposal. And thanks to a separate partnership with Orb, you can stream unlocked media files out to compatible devices such as the iPad, BlackBerrys and Android phones giving you access to home movies and music no matter where you are. But all that power and versatility doesn’t come cheap. A four-bay system with dual 2-terabyte disks carries an $899 suggested price tag, while the same system without the drives included sells for $599. A six-bay system sells for $1349 with 6TB of storage or $899 diskless. The drives will start shipping mid-month and can be pre-ordered from Amazon.com. 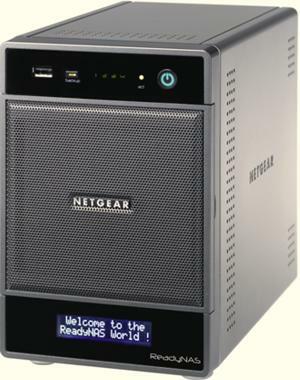 Netgear plans to start selling a two-bay system in October. While it sounds fairly reasonable to me, I want you to go out and try to convince your average computer user this is worth it. Try to explain to them why they should pay more for storage than they paid for their computer with monitor. You aren’t going to get very far. This of course is not a problem restricted to just Netgear. Just take a look at the pricing for Drobo, HP MediaSmart devices and so on. Sure they look enticing at first, until you realize they don’t come with any hard drives and you have to set them up yourself. I could do it, and if you’re reading this post you probably can also, but can your parents do it? Your uncle? Your aunt? The problem is that these devices are in a Catch-22 situation. The price can’t go down until there is more demand, and the demand will never go up so long as they are so expensive. Even when you take the factor out of “will people understand this”, they are a bit on the high side. The ReadyNas Ultra sounds great, I’d love to have one, but I will never be able to find money in my budget to afford $599 just for the basic enclosure. Netgear CEO Patrick Lo told CNET, “We think this is basically the beginning of the end of local storage–those USB drives. This is a major, major breakthrough.” I’m sorry, but Mr. Lo is wrong. You can pick up a 1 TB external hard drive for as low as $77, and it will more than suit the needs of the vast majority of people out there. The ReadyNas Ultra and its ilk are still very much in the realm of “luxury purchases” at their current pricing levels. When I can walk into Walmart and pick up a device like this for under $200, with drives, then you might be on to the end of your standard USB drives. What say you? No matter how much you may desire something like this, will it ever fit comfortably into your budget?